Play peekaboo with this cute little chick! 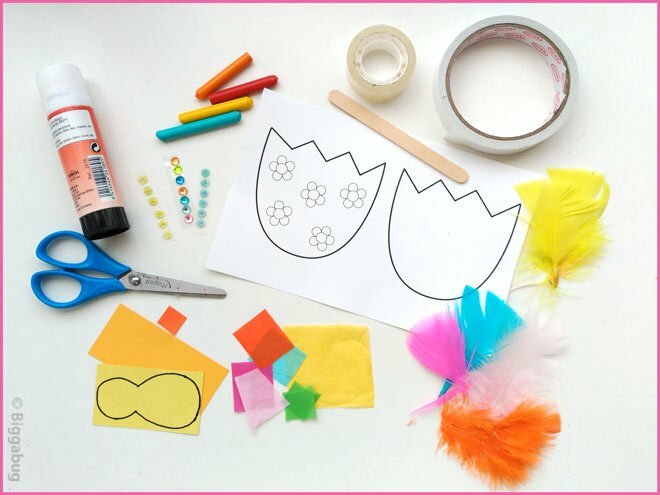 It´s a perfect Easter craft for kids, or to make for a spring theme. 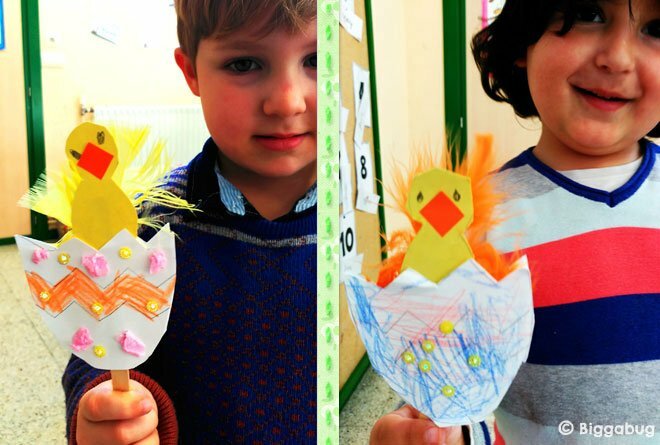 The idea comes from this great Hatching Chick craft at Crafty Morning. I decided to make our chicks actually pop up out of the egg for some added fun value. It´s very easy to make, and will be a hit with your littl´uns! 1. 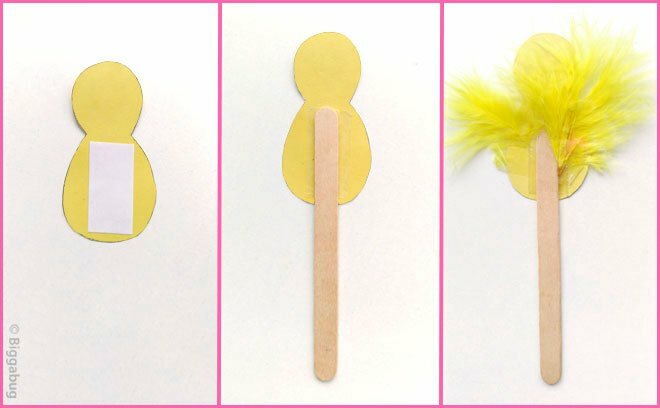 Draw a chick shape onto yellow card (a good size is 10 x 5 cm), or print the chick provided in the template file (see link at bottom of post). 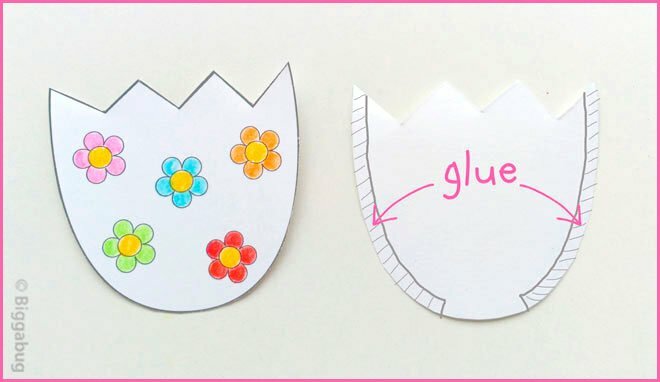 Print the egg template onto white card. You need two egg halves. I chose one decorated side and one blank for the kids to write "HAPPY EASTER" but you could, of course, decorate both sides. 2. Cut out each egg half and colour. 3. Put a thin line of glue around the side edges of one egg, leaving a 2cm space at the bottom unglued. This is where the stick will slot into. Stick the two halves together. Decorate with sticky gems, stickers, tissue paper balls, etc. 4. Cut out the chick shape. Fold a little square of orange card or paper and stick to make the beak. Draw the eyes. 5. Tape the feathers and the stick to the back of the chick. I put double sided sticky tape first, then stuck on the stick, then the feathers each side of the stick, and finally put normal tape over the top. These chicks will be popping up and down like crazy, so make sure everything´s well fixed! 6. 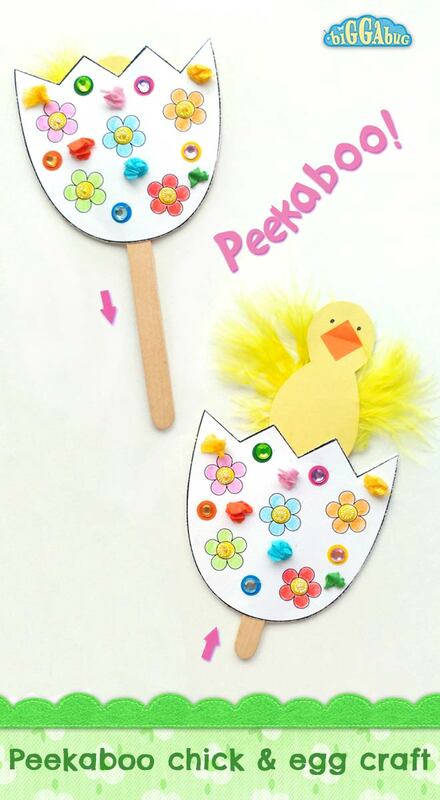 Slot the stick into the egg and have fun making the chick pop-up and down! This is an simple, mess-free craft that is easily completed in under an hour. It´s important that the gap at the bottom of the egg remains glue free for the chick to pop up and down freely. My kids tend to go a bit crazy with the glue sticks, but I drew a lines on one of the egg halves to show them exactly where to put the glue, as in the photo above (Step 2).